I’m always on the hunt for the best garbage disposal. It needs to be quiet, yet have a powerful motor. Plus, the disposal must be easy to install. The American Standard garbage disposal recently caught my eye, so I decided to test it out. After using it for a few weeks, I feel that I’ve put it through enough tests in order to write this review of the device. So, you’re probably wondering whether or not the American Standard garbage disposal 1.25 hp met my (somewhat) lofty standards. You’ll need to read on in order to find out. You’ve probably heard of the American Standard brand. The company is famous for making toilets, faucets, sinks for the bathroom and kitchen, and much more. Some of the brands that this company produces include Safety Tubs, Lixil, Eljer, and Fiat Products. However, they still put out plenty of things under their own name, such as the American Standard garbage disposal. This company has been in business for over 140 years, so it should come as no surprise that they are well-known for making quality products. They started out as the Standard Sanitary Manufacturing Company in 1875. Almost 25 years later, the company joined up with several others, although they kept their original name. Back then, they were best known for their metal radiators, which were hooked up to boilers and used to heat individual rooms in houses. While this sounds like a far cry from the plumbing features that they make today, the piping and general idea are pretty much the same. As of 1929, the Standard Sanitary Manufacturing Company produced more plumbing features than any other company in the world. They kept this record for several decades, despite merging with the American Radiator Company. This led to the name change, in 1967, which made the combined companies known simply as American Standard. They still have global reach, only they’ve expanded their offerings to include garbage disposals, such as the American Standard garbage disposal 1.25 hp. This disposal can take care of just about anything that you put down it, including things that can’t be put down a regular disposal, such as bones. The laser-sharp cutting ring really takes care of business, so make sure to turn it completely off before placing your hand in the unit to get out any pieces of cutlery that happened to accidentally fall down it. This American Standard garbage disposal weighs 15 pounds and measures 15 inches long by 9 inches wide and 9 inches deep. It does take up quite a bit of space under my kitchen sink, which is one of the few things that I’m not thrilled about. If you have a small kitchen and need as much storage space as possible, then this is a problem. With that said the American Standard garbage disposal makes up for this with its powerful motor and easy installation. The installation process went smoothly, as the American Standard garbage disposal came with everything that I needed, including a sink stopper, splash guard, and a pre-installed power cord. The latter is what really matters. Some don’t come with one, leaving the user to have to hunt down a power cord and connect it with the device. Noise! It’s All About Noise! 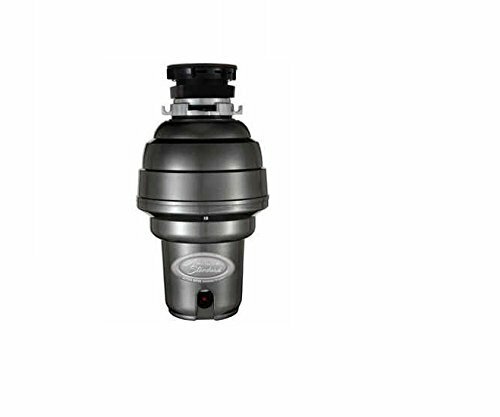 The American Standard garbage disposal has an insulated shell to cut down on the noise level. It also has a balanced turntable, which is what the motor and grinders sit on. This keeps it from vibrating while it’s on. Many disposals have motors that go out of balance during the grinding process, which in turn makes them vibrate in your sink and make a lot of noise. Thanks to the insulated shell and balanced turntable, this kitchen appliance is very quiet. The swivel impellers and the cutting mechanisms are made of stainless steel, so they won’t rust over time. This adds to the longevity of the American Standard garbage disposal. On top of this, the disposal includes a magnetic guard ring around the interior. This collects cutlery, preventing it from ending up inside of the device, where it can damage the grinding mechanisms. I won’t have to worry about losing spoons, forks, and knives to the disposal ever again. Experience – Is It Worth the Money? My experience with the American Standard garbage disposal was overwhelmingly positive. I found that the noise levels are as described – that is to say, very quiet. I was able to have a conversation in the room with the American Standard garbage disposal running, and didn’t have to shout to be heard. Plus, I could hear the other person without any issues. I didn’t have any problems with the installation of this unit. Sure, it took up quite a bit of space under my sink, but that’s my only real complaint. The manual describes the installation process and goes over it step by step. The toughest part is working under the sink, but that’s due to the limited space under there. I particularly like the fact that it comes with a pre-installed power cord, as that makes everything easier. Once I had the American Standard garbage disposal up and running, I gave it a full test. It took care of my food waste quickly and easily. The powerful motor (2,700 rpm, for the record) was no match for anything that I could put down it. I was very impressed with that. The magnetic guard ring is a nice touch that I wish other disposals came with. Overall, I really like this garbage disposal. It does what it claims. You can’t ask for much more! The company clearly spent some time thinking of the consumer when designing this appliance. As you can see, I highly recommend American Standard garbage disposal. I think that it’s a great kitchen appliance. It’s quiet, easy to install, and it can handle many different types of food waste. It even comes with a manufacturer warranty. It’s always nice when a company stands behind its products. If you’re interested in purchasing your own American Standard garbage disposal 1.25 hp, you can do so here. I just have a question, I purchased this unite about 2 yrs ago and I must have left all my warranty info in the box when I threw it away. Well one of the moving parts that chops up the food became dislodged and broke. I know it has a 10 yr warranty but have not been able to locate on the unit it self where I can call to see if I can get a warranty replacement part. Do you have any suggestions? I believe I purchased it at my local Home Depot but when checking there site I see that they no longer carry this brand. Hello Robert, I’ve tried to get more information about warranty on this garbage disposal, however, every reseller states to contact the seller directly for warranty information for this product. I see that American Standard website does not have garbage disposals in their portofolio, though. If your local Home Depot does not have it anymore, they still might have some information about the warranty of the product. You can also contact resellers for more information about that.